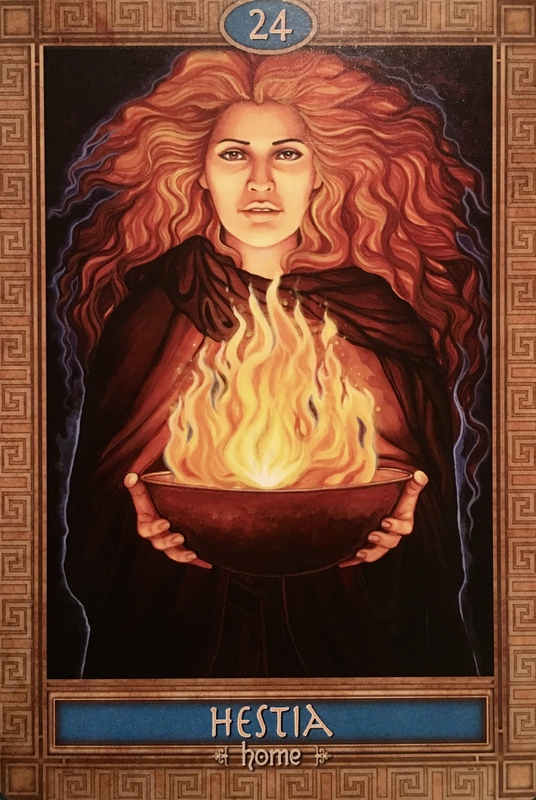 The Message: “This card is all about the warmth and the spirit of the home. It indicates that both home and family are especially important at this time. Our families are not just our blood relatives, but they are the people who care for and nurture us in our lives and the people for whom we deeply love and care. Our connection to family reminds us of who we are and brings us back to our roots both culturally and personally, giving us a sense of continuity, of being a part of something greater than ourselves. Home is this feeling. Home is also the ground we create for ourselves: a place of security, peace, and warmth. we rejuvenate ourselves in this place so that we may have the energy to operate in the world. This is a time for connecting to the nourishing energy of home and family. You can be anywhere in the world to do this; all you need to do is connect to the space within yourself that allows you to feel strong, safe, and warm. This is a time for creating the right ‘home’ space for yourself. If you feel that your home is contaminated, then you must do whatever is necessary to cleanse it. You cannot hope to operate from a clear space within your life or the world unless you are operating from a clear space within yourself and your home. If you have destructive personalities around you, you must create boundaries and remove these people from your immediate space. I have just recently had my home, myself and my children cleared by a friend of mine who’s life purpose is to assist in clearing lower vibrational and dense energies from spaces, people, chakras, etc. I am amazed at the difference this has made to our family dynamics (if you are interested in his services, please contact Leith at Rainbow Spiral Energy Spacekeeper directly). I was also inspired to clean and clear out all the old, take a few things down off the walls, donate things that we no longer need. In combination, it has made an enormous difference to generally improve the chi of the space, I feel fantastic and the kids have noticed a difference too. This is a great time to look at anything in your living space that does not hold a positive or higher vibrational energy. Get rid of anything that does not serve a purpose and just clutters up the space. It is also time to look closely at relationships and assess if there is anyone in your life right now who is doing more harm than good. All of these things have an effect on us, body, mind and spirit. If you are not sure, look for signs: does an object, space or person make you feel drained, frustrated, anxious or overwhelmed? Do you feel repelled or like you should flee the situation? Do you feel that you are being used or your energy is being sucked away? All these are signs that there is unhealthy or toxic energy in your presence. It is also important to create boundaries with people who ask too much of you. Learn to say no, learn to walk away and learn that you are not here to “fix” someone, you can support them, but you are not responsible for their behaviour or their choices, (unless they are dependents such as disabled, elderly or small children and need your care and assistance of course). You can guide people or advise them, but you cannot compromise yourself for them. Creating healthy boundaries allows people to learn the lessons they are meant to learn in their own time. It also allows (or forces) them to take responsibility for their own behaviour. And you for yours.